This article is about BSF JE / SI (Electrical) Recruitment 2018. Border Security Force has recently announced the JE / SI (Electricity) notification for filling 36 posts on its official site bsf.nic.in. BSF invites offline application for JE / SI (Electrical) posts. Candidates can also apply on our site meesevats.in through BSF. Candidates should know eligibility details of BSF JE / SI (Electrical) recruitment before implementation. The application process is going from September 24, 2018 to 01 October 2018. All remaining details are available here. Please check once. The selected candidates will get level 6 (35400 - 112400) from the organization. Interested and qualified candidate can download the website from bsf.nic.in in prescribed form and send your application on or before October 01, 2018. The prescribed format with photocopy of all relevant documents should be submitted to the address specified below. 2 Kadmalala Inspector General, Frontier Headquarters BSF, North Bengal, Post - Kadmalala (Siliguri), District - Darjeeling (West Bengal) - 734011. 3 Hazaribagh Inspector General, BSF TC and S Hazaribagh, Meru Camp, Hazaribagh (Jharkhand) - 825317. Constable (GD), Head Constable (GD) and ASI (GD) are eligible to appear in the LDCE 2018-2019. Merchants from the SI / LDCE QRs are also eligible for joining the SI / LDCE. See more details of educational qualification in the official website below. The selected candidates will get Rs. 35400 / - to Rs. 112400 / - from the organization. Selection will be done according to the limited departmental competitive exam (LDCE) - 2018-19 (written examination, physical measurement, physical fitness test (PET) and medical examination). Interested and qualified candidates can download from the website bsf.nic.in in prescribed form and send their application on or before 26.10.2018. The prescribed format with photocopy of all relevant documents should be submitted to the address specified below. See the details of the BSF postal address in the official notification given below. BSF recruitment 2018: Border Security Force has issued official notification for 103 vacancies of Sub Inspector (Works). Eligible and skilled candidates can send border security force Jobs 2018 applications through offline mode from their official website bsf.nic.in. Interested candidates can apply for BSF Sub Inspector (Works) vacancy 2018 offline by the last of 01 October 2018. Candidates can download official notifications from the official website before applying for this vacancy. 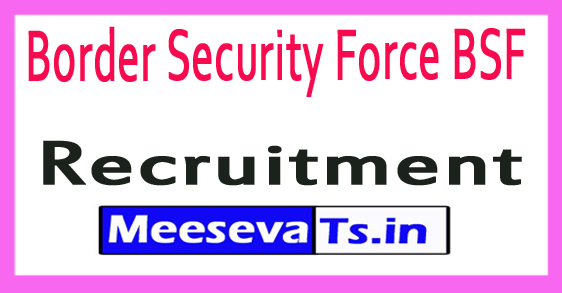 To get more information on recruitment of Border Security Force, such as qualification details such as education qualification, age limit, selection process, application fee and how to apply, important links, courses, admission letters, results, last letter, eligibility details given below. . Apply for Border Security Force (BSF) Recruitment Notification 2018 - 103 Super Inspector (Works) vacancy @ bsf.nic.in. The selected candidates will get the level-6 Rs 35400 -112400 / - from the organization. Inspector General, Frontier Headquarters BSF, North Bengal, Post - Kadamala (Siliguri), District - Darjeeling (West Bengal) - 734011. Inspector General, BSF TC and S Hazaribagh, Meru Camp, Hazaribagh (Jharkhand) - 825317. BSF Recruitment 2018: Border Security Force has issued an official notification for the 65 concaveable vacancies. Eligible and skilled candidates can send border security force Jobs 2018 application through online mode from online official website davp.nic.in. Interested candidates can apply online for BSF 65 vacancy 2018 till the last date of 30-09-2018. Candidates can download official notifications from the official website before applying for this vacancy. To get more information on recruitment of Border Security Force, such as qualification details such as education qualification, age limit, selection process, application fee and how to apply, important links, courses, admission letters, results, last letter, eligibility details given below. . Selected candidates will get 2,1700 - 69100 / - from the organization. No fee for 100 / - and Female / SC / ST / Ex Serviceman and BSF employee. Look around for "BSF recruitment 2018 for 65 posts". Applicants should have completed the 10th Pass + ITI in the relevant discipline or 3 years of experience in the relevant area of ​​a recognized university. Search for "BSF Recruitment 2018 for Constable Posts". Border Security Force BSF Recruitment 2017: There are a huge number of youngsters who've a dream to sign up for BSF. The Higher authority has issued an employment notification for BSF Constable Vacancy to recruit dynamic and enthusiastic 162 Constables posts. Applicants who fulfil the eligibility can practice offline for Border Security Force Jobs 2017 on or before the deadline that's 13th December 2017. We cautioned those applicants visit the respectable portal @ www.Bsf.Nic.In to get extra details concerning the BSF Constable Recruitment 2017. About Border Security Force: The Border Security Force (BSF) is a Border Guarding Force of India and it was set up on 1st December 1965. It is a paramilitary pressure charged with guarding India’s land border at some point of peace time and stopping transnational crime. It is a Union Government Agency under the executive manipulate of Ministry of Home Affairs. Conducting frame of Border Security Force currently issued a note regarding Border Security Force Recruitment. The eligible teenager can grab this first-rate possibility through follow online BSF Constable Bharti Application Form 2017 for 162 Constable. The ultimate date of BSF Recruitment 2017 Application Form for the vacant posts can be 60 days from the date of notification, so apply earlier than the closing date. For the convenience of applicants, under we've noted all critical statistics approximately BSF Constable Recruitment 2017. Qualification: Applicants have to own 10th Class or equivalent from any identified board. Age Limit: The age of applicant need to not exceed fifty two years for Head constable & 45 years for constable posts. Department of Border Security Force invites BSF Constable Jobs Application Form to hire 162 Constable/ Head Constable. Those who wish to paintings with a reputable department can follow for Border Security Force BSF Recruitment 2017 earlier than the closing date. The deadline of follow on-line for the vacant posts will be 60 days from the date of legit notification so observe before remaining date. Let us have a study the application procedure. The applicants are suggested to go to the authentic website or bookmark us for the ultra-modern and updated BSF Constable Bharti 2017. How to apply for BSF Constable Recruitment 2017? After searching the notification hyperlink in BSF Recruitment 2017 section and open it. Application Fee: There are not any software fees for the BSF Constable Application Form. Selection Process: Selection of kids could be based totally on the Written Examination, Physical Measurement Test (PST), Documents verification and Medical Examination. Admit Card: The data about Border Security Force Hall Ticket 2017 will upload on respectable internet site 7 days before the Exam. The candidates will able to down load their BSF Admit Card 2017 from here before 1 week of examination. Result: The BSF Exam Result 2017 will Declare on the reputable internet site by using the branch after the a hit crowning glory of selection system. The applicants may even capable to test their Border Security Force Result 2017 directly from here. After a long term, there's an high-quality opportunity comes from the ministry domestic for the candidates who're searching for or choice to work with the BSF Constable Vacancy 2017. The aspirants who want to serve the state can apply offline for the BSF Recruitment 2017 on or before the final date that is 60 days from the date of notification. Still, if all and sundry of you are going through any form of troubles or having any query concerning Border Security Force Recruitment 2017. The Border Security Force organisation has launched the notification for the submit of Tradesman and Constable Posts. The authorities are searching out deserving and proficient 1074 candidates who can paintings surely for the Constable and Tradesman position. Candidates who are eagerly looking for this kind of vacancies and are keen to apply for the BSF Jobs are required to fill and put up the application bureaucracy before the last date of submission this is 11th October 2017. Candidate can get the utility shape available on its website www.Bsf.Nic.In and there he or she will get the legit notification also. Here you may test the information concerning the utility form dates, technique to apply for BSF Tradesman and Constable in addition to different details. Candidates who're seeking out the web application paperwork are required to get the forms available on its internet site. The starting date to apply for the BSF Tradesman Jobs is eleventh September 2017 and the application paperwork might be available on-line for filling up till October month. The final date to submit the application form is eleventh October 2017. So the applicants who're fascinated are required to publish their application forms before this remaining date that is 11th October 2017. The process to apply BSF Tradesman is on line strategies which the candidate can observe to hold in thoughts various instructions in addition to terms and situations. The candidate who desires to observe for the Constable and Tradesman post need to have the passing certificates for tenth Class or matriculation which should be from the diagnosed Institute. The age of the candidate need to be in between 18 years to 23 years of age in which 18 years is the minimum age standards and 23 years is the maximum age standards. Here you can take a look at the information about the Tradesman and Constable posts info inclusive of the Salary Offered, Selection Criteria, Application Fees, and other information. The authority will offer exceptional profits bundle to its decided on candidate. Apart from the earnings, the authority can even offer more benefits and perks. To get the info you need to hold in touch with our website. The selection of the candidate may be based totally at the candidate’s performance in various choice methods inclusive of the Physical Standard Test, Physical Efficiency take a look at, documentation, Trade test, written test, Medical exam. If the candidate clears those complete checks than lastly he or she will pass for the medical exam. The authority will not price any expenses for the BSF Constable Tradesman. Go to it website bsf.Nic.In. At its major web page, you have to find out the hyperlink to open the notification. Soon after clicking the notification, you may locate the notification page receives opened in the front of your screen. Read all the details stated within the notification carefully and flawlessly. Click on the Apply Online icon by means of which you'll get the Application Form available on its display screen. Fill all of the info within the application form web page and post it via clicking on the submit icon. You will get the registration number just after filing the application form.